Taking reservations for 2019" Assigned parking spot! The moment that you step in the door, you are surrounded by a feeling of relaxation and calm. The bright furnishings and happy decor make it easy to jump right in to a 'leave your troubles behind' mood, and the fact that you are only steps from the Mission Beach and miles of sand and sea bring that feeling into reality! This is a newly remodeled and completely furnished (CDs and cable TV) along with a new 42 inch flat screen TV mounted in the living room and a smaller TV in the bedroom. .DVD player in the living room and WIFI, with the codes and a recap of all the condo information, restaurants, grocery stores, etc on the bulletin board above the desk in the bedroom . Enjoy Sea World Fireworks during the summer. Smell the salt air, hear the sound of the waves, touch the cool ocean breeze and feel yourself relax! This will be a memorable vacation stay. Your fun beach condo is just steps to the Sand - approximately 100. MISSION BEACH, the BOARDWALK, MISSION BAY, RESTAURANTS, SHOPPING, BELMONT PARK (with its roller coaster and wave machine) are just a walk away. SEA WORLD is a five minute drive while SAN DIEGO ZOO, BALBOA PARK, DOWNTOWN SAN DIEGO with its GAS LAMP DISTRICT and OLD TOWN are within a 15-20 minute drive! This panoramic ocean view condo is fully furnished, with soft and comfortable linens, kitchen utensils, a new queen size bed and futons for the kids. In the common area there is a Jacuzzi, laundry room, two built in gas BBQ's, and two beach bikes (for my unit). You can fit up to 2 adults and 2 kids. This complex is gated, and comes with assigned off street parking which is a must have during the busy times. Every care has been taken to make you feel like the special and valued guest that you are! I know you will enjoy your stay and will want to come back soon! This property offers, such a great view of the water, assigned parking, patio right out my front door, Jacuzzi, laundry room on sight. I pride myself on having a clean and healthy unit! No smoking or no pets! This condo comes equipped with everything you need for a comfortable stay along with 2 boogie boards, 2 beach cruisers, 2 beach chairs and 2 beach towels. Hi, This unit is such a fun, cozy place. I have put granite in the kitchen, nice gas appliances, new window coverings, a modern bathroom with shower, put build in chest of drawers, and built in desk. also has the greatest queen size bed. I do rent to 2 adults with 2 children, but DO NOT rent to 4 adults...Just to small for 4 adults! 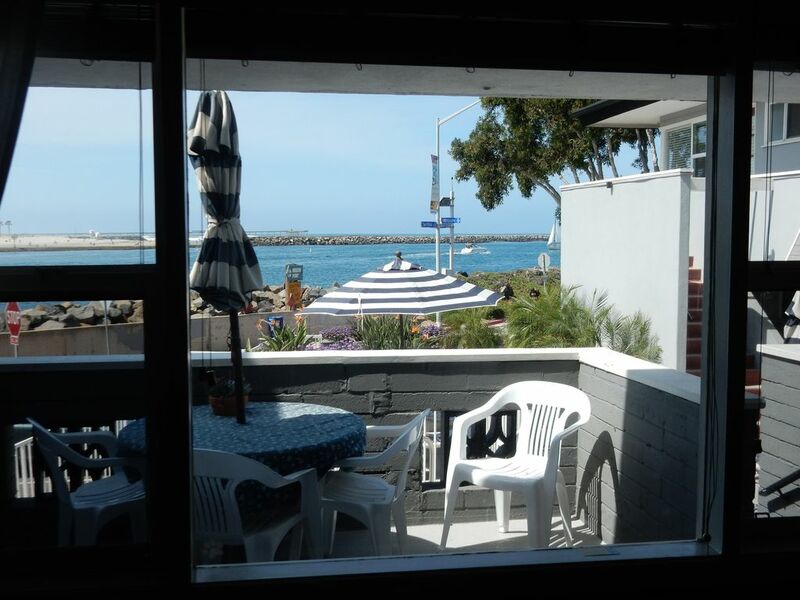 Panoramic view of the pacific ocean from the living room an patio. Small electric stove, for the ambiance, and heat! The sofa and love seat do not pull out, So this sofa and love seat are soooo conformable Futons kept in the closet by day can be taken out to be made up for the children to sleep on at night. 42inch flat screen TV... for the living room, along with a 32inch in the bedroom. 2 bogie boards, along with 2 beach chairs and umbrella, kept in the closet. Patio furniture, Jacuzzi, Gas Grill (BBQ), in common area, Please no smoking in the condo, or in the complex, as this is a no smoking complex... Also no pets Since my sofa doesn't pull out, futons are kept in the bedroom to be folded out for the 3rd and 4th guests, with linens in the closet. Nice clean unit with a great view. The bed was only accessible from one side. The owner was nice enough to drive over to help us out with the lock box. Although there was a reserved parking spot, it took us awhile to figure out how to maneuver into it. We come here several times a year, this is the first time I stayed at one of Bunni's places and I really enjoyed the location and quiet. 5 minute walk to the beach and low on traffic. The house was clean and inviting and had all the amenities needed to cook, clean, and heal from a sunburn. Awesome and exactly as described. The condo was so cute and we enjoyed our stay close to the water and relatively easy to get around. Bunni was helpful and easy to work with. A few things parking is tight so nothing bigger than a small suv, also pack shower items as non are provided, everything else for your stay is there! Will stay again, hopefully soon! Clean and comfortable condo and so close to both the ocean and bay. Everything was as described in the condo. Good access to downtown and the airport. Enjoyed the hot tub also! Location very south end of mission blvd., but bike cruisers available and lots of Bird electric scooters nearby to get you to the bars and restaurants about 1-2 miles away. Nice complex and views. You won't be bored here, you can just relax and do nothing Or enjoy the many local activities that are 5 miles or closer, Sea World (2 miles)fire works can be seen nightly, Navel Training Center, the world Famous San Diego Zoo, SD airport is app, 5 miles, San Diego has so much to offer, multiple golf courses, swimming and other beach activities, You can walk the beach to Belmont Amusement Park, ride the roller coster, WHY GO ANYWHERE ELSE!